"It would be like your mom saying to you when you were a teenager, 'Here's your lunch money and, by the way, I want you to buy yourself a car, so you can't borrow ours.' And you'd say, 'Well, mom, I've only got lunch money.' 'Well, I don't care. You go get a car.'" -- Apollo 12 Astronaut Alan Bean, on the July 17 episode of NPR's Science Friday, explaining why he thinks NASA's budget is inadequate to pay for the agency's current plans to return to the Moon by 2020. Microsoft and Yahoo's long trip down the aisle has been worthy of Jane Austen, beginning with months of awkward flirting and unrequited passes. But after 18 months of courting, the two families were pleased to formally announce the companies' pending marriage. All are invited. Microsoft comes to the deal with a much-needed dowry for struggling Yahoo. But the pair's future will depend just as much on what investors and regulators think of this arrangement as it will on the technology and marketing smarts this union would combine. I rounded up some background and instant analysis on NPR's All Tech Considered blog this afternoon (my first item for NPR.org). Commenters chimed in as well. One wrote, "I heard that Google is giving them a lovely toaster"
Asked another, "Where are they registered, eBay?" In that posting I also wrote about the "Microhoo" label and some of the other clever names that headline writers and bloggers have used to shorthand this deal. My new favorite is "Yang," which combines "Yahoo" with "Bing," the new Microsoft search engine. Only trouble is whether Yahoo cofounder Jerry Yang would nix THAT merger, as he did so many others before stepping down as CEO last year. This posting is adapted from my final "Futurist" column for Congressional Quarterly, which appears in the July 20 issue of CQ Weekly. My grandfather attended many space launches as a senior IBM contractor during NASA's moon program. But it's the parties before and after each mission that still loom large in his memory -- particularly the one on the eve of the historic circumlunar flight of Apollo 8 late in 1968, when he met Charles Lindbergh. 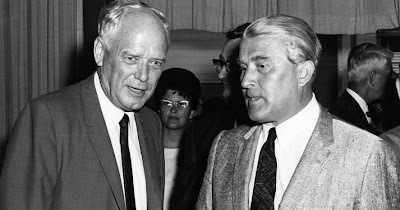 Lindbergh, who was 66 by then, was chatting with Wernher von Braun, the German rocket pioneer and mastermind of NASA's towering moon ships, before my grandfather introduced himself to the famed aviator. Astronauts were in attendance, too. But in a room full of heroes, Lindy was the brightest star -- the man who inspired many people there to go into aviation and the aerospace business. Just like that evening's host, astronaut Wally Schirra, my grandfather was 4 years old when Lindbergh made his solo flight across the Atlantic, 41 years before. Now, as the world recalls the Cold War space race, which culminated with the Apollo 11 landing 40 years ago this week, Lindbergh's legacy once again seems to put into perspective what Neil Armstrong hailed as a "giant leap for mankind." Von Braun often cited Lindbergh's 1927 flight when answering critics, who wondered if the billions the United States spent sending astronauts to the moon was worth the investment. "I do not think that anyone believed that his sole purpose was simply to get to Paris," von Braun would say, explaining that Lindbergh's true objective was to capture the public's imagination by dramatically demonstrating the possibility of trans-oceanic flight. "In the Apollo program," von Braun sometimes said, "the moon is our Paris." Much had indeed changed between Lindbergh's flight and the Apollo launches, two of which he attended. Just a few months before Apollo 8's first flight around the moon and a year before Apollo 11's landing, Boeing rolled out the first of its huge new 747 jumbo jets, capable of ferrying hundreds of passengers thousands of miles in nonstop luxury. Orbiting satellites were beginning to beam television signals and other communications around the globe in an instant. And the aerospace industry's needs were accelerating the development of smaller, faster computers. And since Apollo? In some ways, technological developments in aerospace have continued along the same flight plan. Satellites, for instance, helped enable worldwide computer and telecommunications networks that simultaneously permit an airline passenger with a laptop to answer e-mail at 30,000 feet and a pilot in Nevada to fly robotic aircraft in combat missions on the other side of the planet. NASA has continued to accumulate achievements, from the unmanned probes that have wandered the surface of Mars and the edges of the solar system to the Hubble Telescope, whose recent repair by a space shuttle crew was also a reminder that humans still have something to contribute to space exploration. But von Braun would have been disappointed by the space program's pace, without a Paris or a moon race to galvanize the public's imagination. In the final days of Apollo, before policy makers lowered their gaze to more urgent matters on this planet, the rocket engineer detailed ambitious plans for putting astronauts on Mars in the 1980s. Under NASA's current plans, in contrast, astronauts won't return to the moon's surface before 2019 -- fully half a century since Armstrong took his first steps. 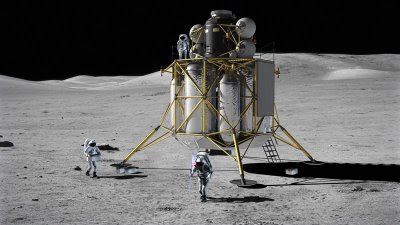 In fact, the next person to walk on the moon might not have any memory of the moment when the first humans landed there; as noted in a previous posting here, six of the nine astronaut candidates NASA named last month were born after July 20, 1969. Twenty five years ago, President Ronald Reagan challenged NASA to work with other countries to "develop a permanently manned space station and to do it within a decade." Over budget and more than a decade late, the International Space Station really opened for business Oct. 31, 2000, when a rocket carrying its first long-term crew lifted off from a Russian spaceport. And that orbiting outpost has now served as home for a continuous succession of visitors for more than 104 consecutive months. But does continuous mean permanent? Is that Apollo's legacy? Future history books might remember either the space station or the Apollo moon landings as the beginning of humanity's extraterrestrial colonization. Or perhaps these "small steps" will turn out to be more like L'Anse aux Meadows in northern Newfoundland, the location of an 11th century Norse sailing camp. That temporary settlement, rediscovered by archeologists in 1960, predated the voyages of Columbus by half a millennium, making it Europe's earliest known toehold in the New World. But "permanent" European colonization of the North American continent would not begin until centuries later. The timeline for the next major phase of human migration will probably be measured in similar increments -- not in 40-year or 80-year spans. But, as Lindbergh wrote in Life magazine around the time of the Apollo 11 landing, scientific accomplishment is "not an end." It's "a path leading to and disappearing in mystery." Newman was KRON-TV's science editor when that story aired. Not many of those left in local TV. Now Newman lives in Pilot Point, Texas, and is executive editor of Earthweek -- a Web site and syndicated column that began life as a print feature in the San Francisco Chronicle in 1988. "We in print and TV all thought back then that we would eventually prosper and thrive in the new media. I felt so confident in the Internet's future nearly 20 years later in 1998 that I quit a lucrative TV career to focus on my syndicated newspaper column -- 'Earthweek: A Diary of the Planet' -- and its online component. Now the newspaper version is threatened with extinction and the Web version doesn't make enough to live on. Local TV news is no longer an option for someone who has matured with a face meant for the radio. It's a good thing I invested somewhat well." 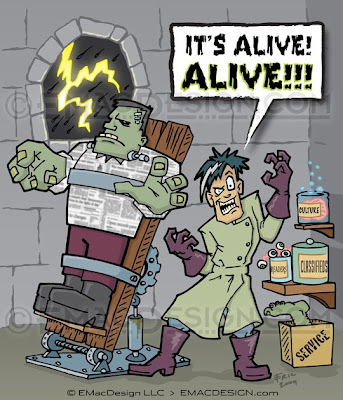 For anyone whose ever worked in the newspaper business, watching the industry's struggles to rebuild itself can feel a bit like being one of Dr. Frankenstein's horrified friends in the 1931 film version of Mary Shelley's novel. The illustration above by my friend Eric MacDicken captures the horror I've been feeling as newspapers, reanimated somewhat online but stitched together with lifeless lines of business, try to lift themselves from the table -- perhaps to ultimately turn on and destroy their crazed makers. 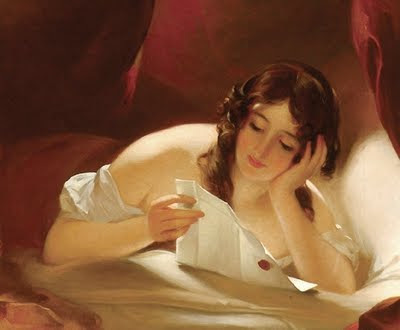 The industry's desperate and circuitous debates -- about online subscriptions, PDF editions and how to reestablish mass market media dominance in a highly niched, multimedia world -- hint to me of a self-destructive Frankenstein-like madness. But others in the media business see very different monsters. Les Hinton, Dow Jones' chief executive and publisher of the Wall Street Journal, recently described Google as a Dracula-like figure, feeding on the blood of traditional media institutions -- by which Hinton meant freely distributed Web content. I saw Hinton's remarks in a Crain's New York Business report on his speech at last month's PricewaterhouseCoopers Entertainment and Media Outlook event. Google may not have started out "in a cave as a digital vampire per se," the newspaper executive told the audience. "The charitable view of Google is that the news business itself fed Google's taste for this kind of blood." By giving away content, Hinton said, newspapers "gave Google's fangs a great place to bite.... We will never know what might have happened had newspapers taken a different approach." Those who feel otherwise, who agree that Google is the vile blood-sucker that Professor Van Hinton warned about, can comfort themselves by putting virtual garlic flowers and pay walls around their necks. After all, cutting off the Googlebot's ability to find and link to one's content is a technological snap. So if Google really is villainous, why haven't more news organizations stabbed it in its algorithmic heart? Because most advertising-supported Web sites understand that the bite out of their own page views and user counts would be far more fatal than the one Dow Jones' CEO fears. A full account of what I saw and learned during yesterday's amazing Zeppelin ride, which I mentioned earlier this week, is still in the works. But I did want to share a timely anecdote from the trip. The story does not say much about my beat -- the future -- but it does reveal a little about how my business, journalism, is deploying limited resources at a time of increased competition, dwindling audience and limited resources. Brian Hall, president and co-founder of U.S. Zeppelin operator Airship Ventures, was on board serving as "flight attendant" for the five passengers, but he also had other business to attend to. 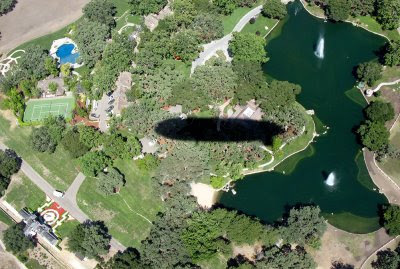 For the first half of the trip, Hall and his colleague David Knight were in negotiations with TV networks about whether their airship, Eureka, could be used the next day to follow a motorcade that was expected to take Michael Jackson's body from L.A. to his former home at the Neverland Ranch in Santa Barbara County. While the 246-foot-long German-made airship is huge -- longer than a Boeing 747 -- the helium-filled vehicle's ability to travel slowly and hover in place for long stretches of time makes it an ideal platform for many media assignments -- better than a helicopter in a lot of ways. The transit flight down the coast gave the Airship Ventures team a chance to plot the route and location. 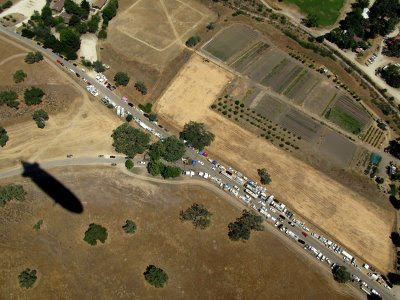 But by the time we arrived over the ranch, north of Los Olivos at 3 p.m. PT, the plans for the motorcade were off, and Eureka's services in the Michael Jackson media circus were no longer needed. We did a few quick orbits over the property and the amazingly long line of TV trucks and other media vehicles along the road in front of the ranch. Then we continued along our way. "Hopefully we scored some air time," said Hall, whose company began offering aerial tours in the Bay Area last fall. I should note that I was a paying passenger on this trip, which I took on my own time and dime. I also just heard on TV that my erstwhile co-author, CNN's Larry King, is doing a special program on the Neverland Ranch tonight -- in case you want to see more of the place. Personally I think a lot of viewers have seen enough. This summer's Disney/Pixar film "Up" prominently features a classic airship, the "Spirit of Adventure" (shown above). A mock news reel shown at the beginning of the movie says the giant 1930s-era dirigible was as long as "22 Prohibition paddywagons" and served as the world-traveling home of historic adventurer Charles Muntz. Those images captivate young Carl, the movie's protagonist -- much as images of the real-world dirigibles that inspired "Spirit of Adventure" first captured my imagination when I was eight-years-old. The idea of a flying ocean liner activated both my obsessive grade-schooler's focus on anything aeronautical and my matching interest in skyscrapers and other massive feats of human engineering. Like Carl in "Up," the decades since then have done little to dim my fascination -- which perhaps explains why I am in Northern California tonight, too excited to sleep on the eve a 400-mile flight down the Pacific coast on a real German Zeppelin. 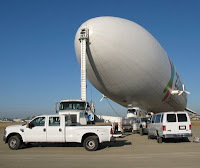 The airship Eureka, which I'm scheduled to ride tomorrow from Silicon Valley to Long Beach, is one of four such Zeppelin NTs built over the past dozen years. They were made by the corporate offspring of a company founded more than a century ago by Count Ferdinand von Zeppelin, an aviation pioneer whose name is now synonymous with these kinds of aircraft. 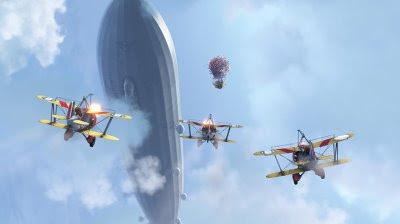 But these new Zeppelins use helium for lift -- not the hydrogen used on the ill-fated Hindenburg. The Hindenburg disaster ended the era luxurious, intercontinental airship travel more than 70 years ago. And yet classic airships continue to be a nostalgic fixture of science fiction and fantasy books and films -- from the floating electronic billboards of "Blade Runner" to the fleets of Zeppelins featured in the movie "Sky Captain and The World of Tomorrow", Philip Pullman's "His Dark Materials" novels and Kenneth Oppel's "Airborn" series. Second Life users whose avatars are aspiring aeronauts can even buy and operate their own virtual airships, some of which take their names and designs from historical zeppelins and airfields -- or from even earlier ideas for sky boats. Some in the aviation industry appear to share these romantic visions of large-scale, lighter-than-air travel -- as I noted last summer in a posting here about some real-world airship projects. These visions tend to focus on rigid or semi-rigid airships, rather than non-rigid blimps (the boneless chicken of airships), in part because their frames would allow for better engine placement for steering and greater capacity for carrying cargo or people. But grand dreams of environmentally friendly dirigibles efficiently hauling cargo or passengers across remote areas or around the globe always seem to encounter some kind of engineering, economic or institutional turbulence. ZLT Zeppelin Luftschifftechnik GmbH & Co KG, the company that built the airship I'm scheduled to ride a few hours now, is an exception. Its Zeppelin NTs are currently in service in Germany, Japan and now the United States, ferrying tourists on short trips and providing a high-profile billboard for creative advertisers. But the company also is exploring ways to use the Zeppelin NT as a platform for scientific and surveillance missions. Tomorrow's scheduled journey is the California-based Eureka's second extended sight-seeing trip from its new home near Sunnyvale. The ship's first flight to the L.A. area and back straddled the Memorial Day weekend -- when, as it happens, Disney/Pixar was using the Eureka to help promote "Up." I'll write more in a follow-up posting about my trip -- and about Airship Ventures, the Bay Area start-up that partnered with the Zeppelin's builder to offer these unconventional "flight-seeing" trips and advertising opportunities late last year.